bring to the market the most comprehensive and feature packed system available in the world today; combining aspects of home automation technology, activities of daily living assessment, secure internet communications, health monitoring, family and friend socialization and awareness, cognitive stimulation and even energy control, in one flexible, affordable system. 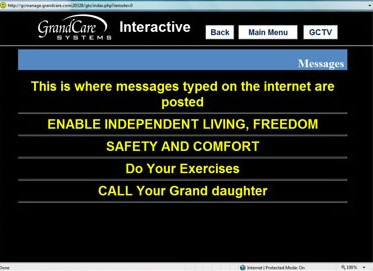 GrandCare systems are available in 4 models. COMO, Trillibit, and Trillium (Kiosk, and tabletop versions). 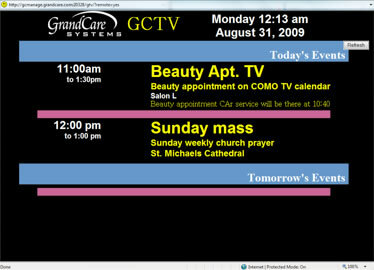 All models connect to the Internet, The Trillium is a 15”-19” touch screen (similar to a bank ATM machine), while the COMO connects to an existing TV or a standalone monitor (similar to a digital picture frame or 2nd computer screen). The Trillibit is a 9” portable tablet with touch screen. The Trillibit has a full featured keyboard for easy generation of care notes and email and is slightly larger than the Apple I-Pad. Because these systems have taken into design consideration, the active senior generation and disabled. The need to possess computer skills or knowledge is virtually eliminated. The COMO system is perfect for hospitals, assisted living facilities, and homes when resident interaction is not necessary but family and doctor communication to the patient/ resident is. GrandCare systems can easily be set up so they do not pose a risk to the security, integrity, or compliance regulations of the hospital network. 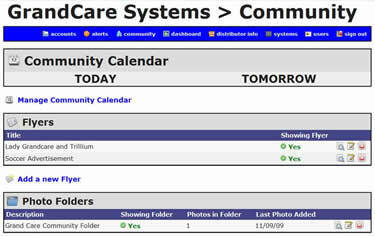 The Trillium System is fully interactive and communicates inward and outward via the internet and has many accessories for providing the real time statistical awareness of a person’s activities and health conditions. This is the screen shot that your loved one will see on their TV screen, their tabletop, wall mounted, or even cart on wheel touch screen. On the Trillium, just a single tap of the finger will allow navigation around what the system options are set to do. 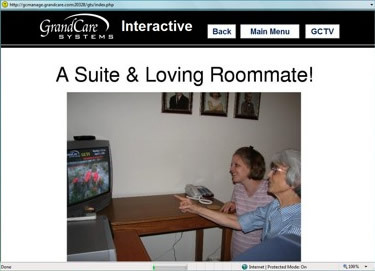 When fingertip navigation activity ceases, the system will automatically switch to GrandCare TV to provide entertainment, knowledge, and communication from family, friends, and doctors. 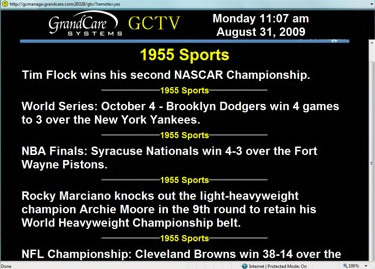 GrandCare TV functions similar to that of a screen saver for your personal computer. It is easily set up to scroll the information you choose to display. At the touch of a finger your loved one can view messages sent to them, view photographs, navigate to different websites without a key board or mouse, and even listen to audio messages that are sent to them from any computer in the world. 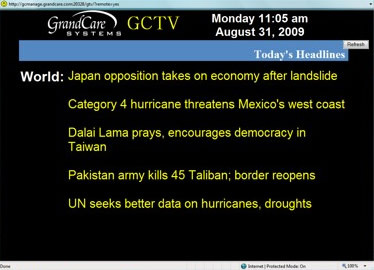 The local weather forecast will be shown as part of GrandCare TV as well as many other optional pieces of information you choose. Entertainment headlines... In reality, it is kind of like a personal family TV channel. Family Picture folders can also viewed in GrandCare TV. Both Trillium and COMO systems have enough built in storage that your family’s most cherished memories will always be seen. Warning: Your loved one may never watch cable TV again! 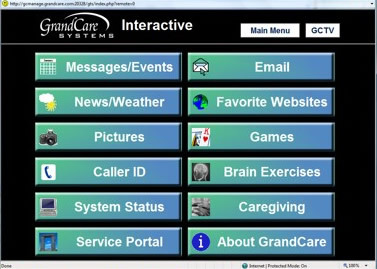 GrandCare community and Kiosk based systems are intended to be used for multifamily developments and facilities where every individual GrandCare unit can also share information with others. Pictures, flyers of community events, and even menus are shared and accessible by the family and caregivers. 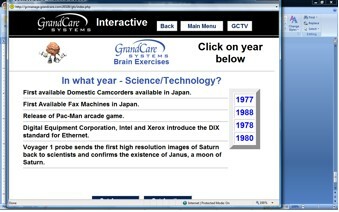 Consider this easy to use system the one touch technological connection bridge for seniors (e.g. face book and MySpace) since they grew up differently and without home based computers. 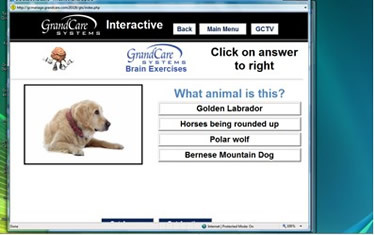 There is an assortment of games, and brain exercises for entertainment purposes and to increase cognitive health. 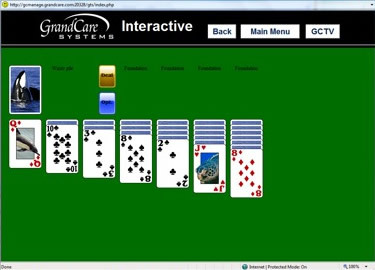 Trivia, Solitaire, Mastermind are the games currently included. And then there is pick the caption. This cognitive stimulation is based upon the names of the family photos you upload! This is a Meerkat Hi from the family vacation to the San Diego zoo. 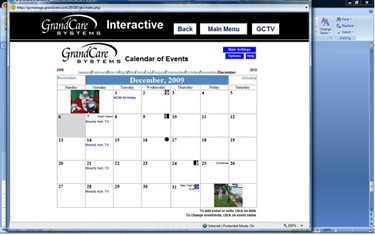 Your loved ones calendar events can be viewed and modified. You can add daily events as well as single events, yearly events, care notes and even set automatic reminders. 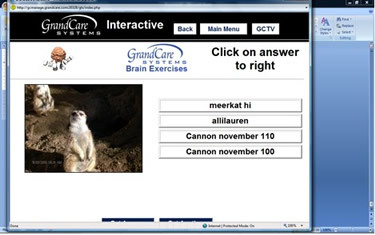 If the Care Giver was to add an internet camera (separated than this system) they may see pictures like this from their own computer.